My husband is seldom surprised anymore when I talk to him about my crazy vacation ideas. Our most recent vacation was no exception! On our last trip to England we were at a really lovely pub along the canals and watched the narrowboats come through the locks. We were fascinated by the whole process and we chatted with the people in the boat. The idea of renting our own boat and navigating around the waterways of England sounded like something we would really enjoy. As we like to have a little bit of vacation time on our own during all of the hustle and bustle of going around and visiting family when we come to England I suggested we stay in the country but try a little something uniquely British – cruise the canals! He thought the idea was a good one and I started looking into narrowboat rental companies. Canals in England go back over 200 years and the first ones were built as ways to transports goods from the country into the cities more efficiently. They were for all intents and purposes “water hiways”. One of the first canals built was the Oxford Canal which formed part of the main route between London and Birmingham. The Grand Union Canal came a few years later in 1793 and is the route we chose to cruise with our Narrowboat. 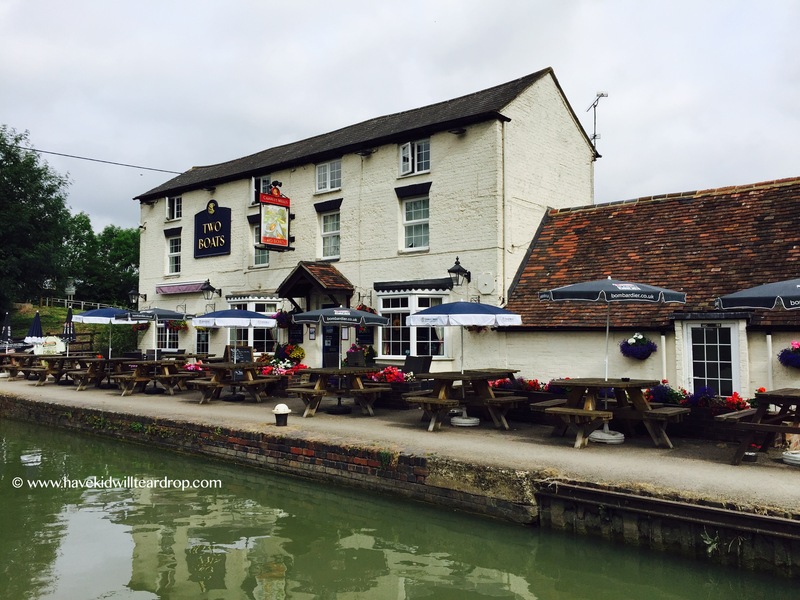 It connects with the Oxford Canal and takes you through the towns of Warwick and Royal Leaminton Spas as well as the small town of Long Itchington (this was as far as we travelled due to time constraints, but you can go all the way to Birmingham and beyond). Historically the barges were loaded up at various way points and were pulled by horses along the towpath right next to the canal. These towpaths are still heavily used in many areas not only by boaters, but the general public as they make up some of the public walk ways and bike routes around England. As you travel along the canals you will notice several elevation changes which require locks that you must operate in order to move around. Different routes have various options depending on whether you want want to work more or fewer locks. When I started looking into boat rentals I came across Kate’s Boats, which are based in Warwickshire but have two bases of operation – one at Stockton Top Marina and another in the town of Warwick. According to Trip Advisor and my mother in law (she checked into them for us before we sent a bunch of money over) Kate’s Boats has very high marks, great reviews and were reliable. We found them to be professional and friendly. They answered all of our questions in a very quick manor and made everything so easy for us. They were good about sending confirmations to me and all of the information we needed before we came. When we arrived they did a run through with us on the boat that was clear and concise and they took us through our first lock to get us on our way and to show us how everything worked. We were very happy working with them and and would recommend them to others. There are several different companies with various boat options and depending on where you would like to travel and how much time you have. I would recommend considering companies that are in the areas you want to travel to and through. We had a chat with a few of the volunteers from Royal Canal Trust on our last day boating and they confirmed to me that most of the boat hires are very similar. 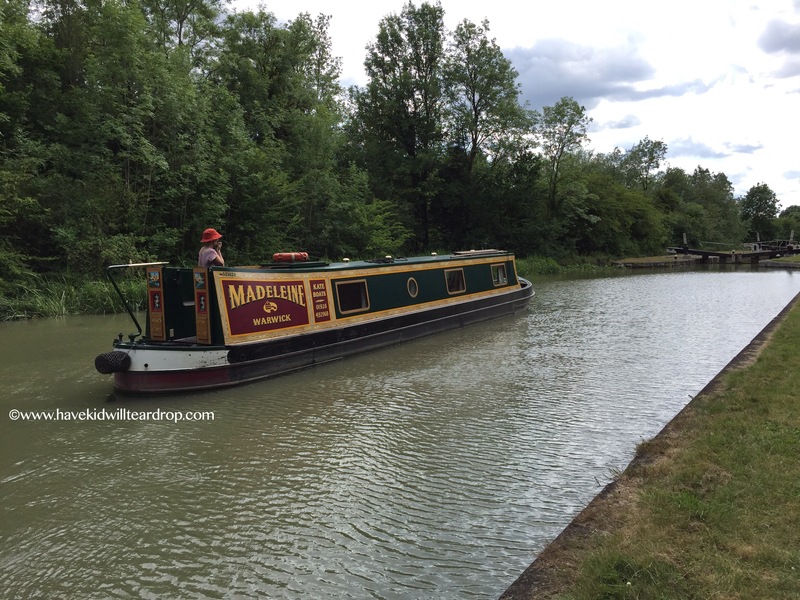 The companies they like the best were Napton Narrowboats, Calcutt Boats and Kate’s Boats for the areas along the Grand Union Canal and the Oxford Canal. There are lots of other companies out there for the different parts of the country. With only 3 of us we thought a boat on the smaller side would suit us well and we picked a boat with the amenities we wanted to have. We settled on the 47’ Madeline for our adventure and picked her up at the Stockton Top Marina. We had 2 full beds, a complete kitchen (fridge, stove, microwave, and everything we needed so we could cook), all of the linens were made available, and we had a full bathroom with flushing toilet, sink and a shower. The boats have TVs which made movie nights possible for us when we needed to rest after working the locks all day and a radio/stereo system. If you are traveling with more than 4 people you will need a bigger boat but there are several layouts and set ups to choose from. For the 3 of us this we felt like this boat had everything we needed to be completely comfortable – I felt like we chose well. The price for us also included the diesel we needed for our trip and insurance. We booked what they call a “short break” rental which was less than a week. My husband and I were talking about the amount of time we were on the boat and feel like 2 weeks would have been too much for us with the way we did things this time. At the same time we felt like the 4 days were too few and we would have liked to have been out a bit longer. Doing our adventure during the shoulder season when English school kids were not out of school for the summer reduced our cost a little bit and the canals were not as busy as they are during the school break times. We were also boating during the week, and I assume it was quieter due to that as well. This is going to be a personal decision. At the time I wasn’t sure how long to rent for and where to go, but was under time constraints as we were in England to visit our family and needed to make sure we left plenty of time for that. Having never been on a narrowboat and not really knowing the area we just kind of flew by the seat of our pants. We knew the narrowboat only traveled at the blistering speed of 4mph when you are underway (the paperwork told us to get ready to slow down and that is really no joke!). That is essentially the same rate of speed at which we walk. Working the locks adds time as well. When we picked up our boat we bought a wonderful canal map for the area we were in (there were several to chose from depending on where we wanted to go). The map explained that the best way to figure out roughly how long it would take from point A to point B is this: add up the number of miles you want to go, plus the number of locks you need to pass through, then divide by 4. We were on a canal that had lots of locks for us to navigate, so we didn’t move along as quickly as we would have with out them. The other factor is when you are on the canals, some locks can fit 2 boats, and some only one and there can be back ups in waiting to pass through, especially as people are going both up and down the canal. This will affect your travel times as well. 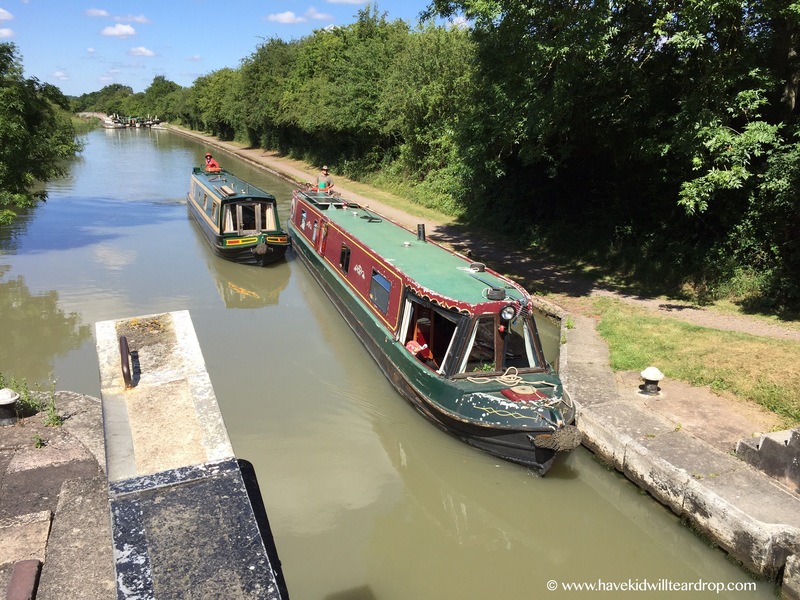 When we drove over and saw the Oxford Canal the locks could only accommodate 1 boat at a time and the volunteers said people were lined up waiting to go up and down the locks. We didn’t really experience this on the Grand Union Canal. It appears to be much quieter. The canal maps are great for several reasons. While you are following a canal and are basically going in a straight line making it hard to get lost, it is nice knowing where you are going and how far away it is. It is also handy for when you need to figure out where you want to stop. They mark out areas where you can fill the boat up with fresh water, tell you where the marina’s are in case you need fuel, they often show villages that are right near the canals and some of the streets and sights, and they list all of the pubs where you can stop for a drink and food. We often moored outside of the pubs along the way for the night as did many others. It makes for easy dinners and after a hard day of working lots of locks a solid meal and a quick pint is good pay off. We found the maps to be helpful when looking for food stores and points of interest as well. We noticed some people had entire books that mapped out several of the canals and how they connected (they were either on longer journies or went out boating a lot to different areas). I would recommend getting getting either a map or a book and the boat hire places should have the ones you need. 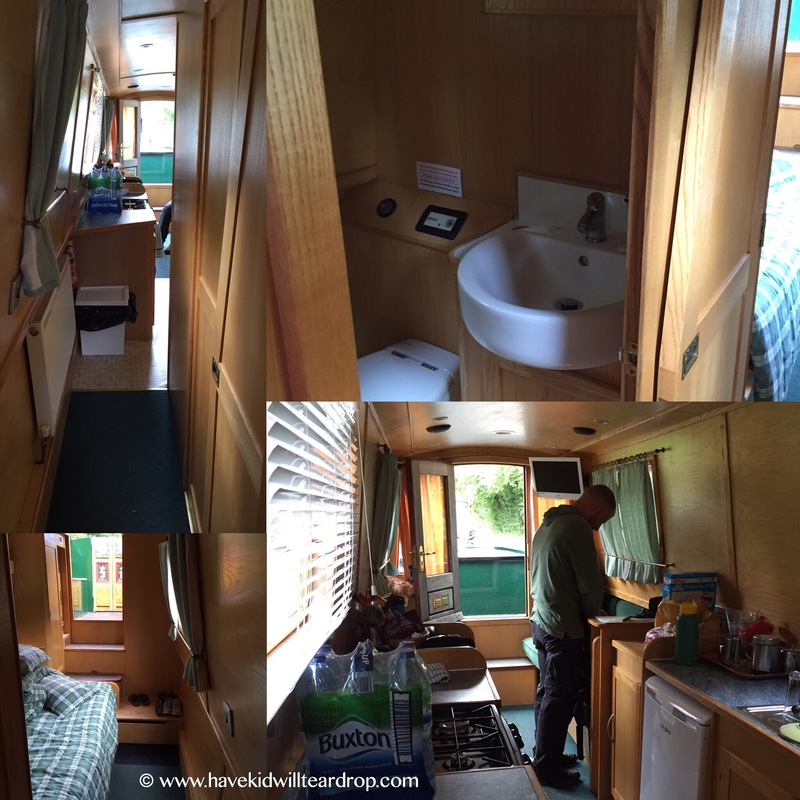 We really loved our narrowboat trip and we hope to do it again. As I mentioned before, we will book for a bit longer next time and have talked about other areas we would want to adventure through. We felt like it was a great family adventure where mobile phones seldom had service which allowed all of us to unplug and enjoy our time being together. We highly recommend this even for first timers. They run you through all of the ins and outs of the boats and the locks and while there is a learning curve we found we really hit our stride by day 2 or 3. If you are heading to England and enjoy a laid-back but active holiday where you family can connect, have a look at narrowboating!